Do you ever wonder where this whole blogging thing will take you? It’s easy to look at that calendar in front of you, with all those blank boxes just waiting to be filled, and hope that something amazing will happen. That your blog will thrive. That you’ll make a difference in someone’s life. These are the same things you hoped for last year, and now at the end of the year you’re barely crossing the finish line, battered and bruised from all the hard work of blogging with your heart open. A lot of blogs were born this year…and a lot of them died. People showed up every morning, coffee in hand, to battle the blank screen in front of them and write words that would matter. But they listened to all the voices that said they were only worth as much as their page views. And so they raced and toiled, churning out three posts per week, neglecting their families and their lives, just so they could bow to the Almighty Page View in hopes that a big brand would want to sponsor them, or so more of their readers would click on ads, and somehow it would all be worth it. People started with passion for spreading their message, but ended up frustrated and tired. I want so much more than that for you. I want you to powerfully own your business. I want you to make smart decisions and to be intentional with your time. I want every blogging seed you plant to grow and bloom into something beautiful and great. Whose dream are you creating? Are you waiting for a certain number of page views to be successful? Are you chained to your desk with too many irons in the fire, wondering if it’s always going to be this hard? Are you striving and toiling in a frantic push to sell another company’s stuff? Yes, blogging is hard work. 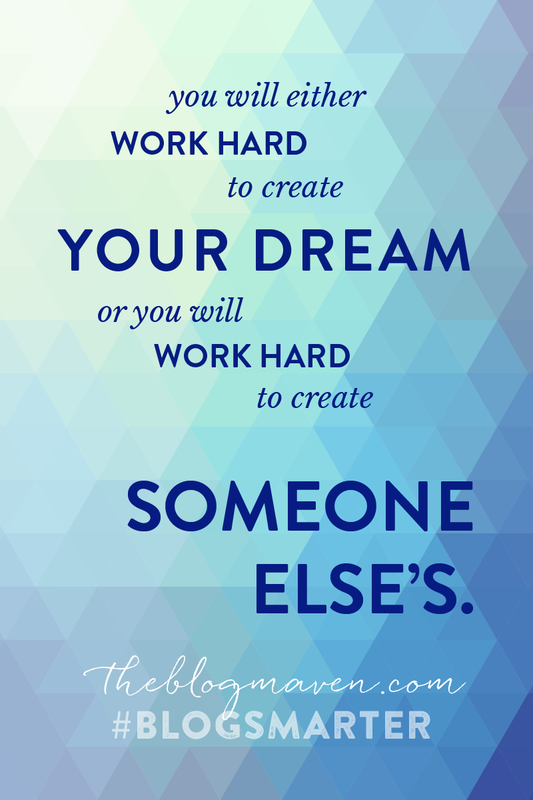 Or you will work hard to create someone else’s. or you are getting paid to send them somewhere else. You don’t have to be chained to your page views. You can make money without ads, without sponsorships, without heaps and heaps of traffic. The secret to your success this year? People come to your site because they are looking for something. They want to do more, have more, be more. They love the way you write, the way you teach, the way you live. They’re looking to you for leadership – for advice on how they can be the people they want to be. And you can give them what they need. Find out what people want. And you don’t have to be an “expert” to do it. and deliver it to your people. And instead of making pennies per click, you’ll be making dollars. Dollars you can use to help your family. Dollars you can use to support your favorite cause. Dollars you can reinvest in your blog – into your business – to make it everything you want it to be. You will be working hard this year. Don’t waste it creating someone else’s dream. Wow. I don’t even know what to think about this. I hadn’t planned on writing an ebook until I was getting a lot more traffic. What do you mean about not needing as many page views? I just mean that you don’t have to wait until you have 1,000 page views per day to start making money from your blog. Let’s say you have just 1000 visitors per month, and the only ad you have on your site is an ad for your own $20 ebook. If 0.5% of your visitors bought your ebook, that’s $100 you’ve made – and that’s just the money. Actually, having an ebook can do a lot more than just make money – it’s an amazing credibility booster as well. Visitors know you’ve written a book on your topic, and that instantly positions you as an authority – someone worth following. Such a wonderful reminder. Inspired to rethink things a bit. Thank you so much! Pinned this to my blogging board on Pinterest. Nailed it, Jeni. We’ll only get so far working for others. The question is, can we really get over our own self depreciation and our stats long enough to boldly and generously serve the readers we have today? Creating an ebook was the best thing I ever did as a smaller blogger. I was naive enough to think it was worth doing, though I had no stats to speak of at the time. Sure enough, on launch day, I sold 2 copies. But releasing a book that brought some of my best content and ideas in one place for the convenience of my readers showed them I was serious about serving THEM, not just using their presence to grab the attention of sponsors. 3 1/2 years later, that book is still selling, and I’ve had freedom and flexibility in my blog and business that I would never have experienced had I been courting ad networks and sponsors. And even though my numbers aren’t huge, when I have a conversion, I make $10 instead of a few pennies, creating a nice, part time income with a very relaxed blogging schedule. I so appreciate your timely reminder to think like an entrepreneur and serve the readers I have. Also, that it doesn’t matter what product you create–I get kinda hung up on thinking it has to be spectacular and ground breaking, but if it effectively serves my readers, it IS awesome, right? So, I’m shooting for a simple e-course this year. 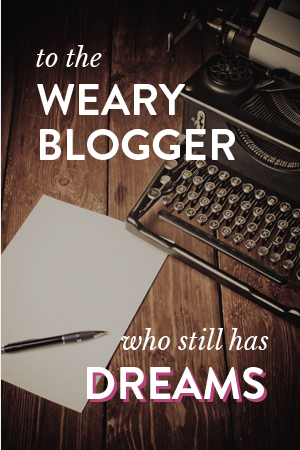 Now off to share this good news with other weary bloggers…! Thanks for your thoughtful comment, Trina. I love your point about the book still selling 3 years later. You did the bulk of the work one time, and it’s still paying dividends. +1000. Cheering you on with your e-course! Hey hun, thanks for the encouraging comment. May I ask if you or Jeni have a tutorial to follow about how to create an ecourse? Hi Amy, I don’t have any tutorials on that – it’s actually a HUGE topic. If you’ve never taken an online course before, that would be the first place to start. Different teachers have different styles (and formats) of teaching. It might be worthwhile for you to join an inexpensive site like Skillshare for a month and check out several different courses offered by different teachers. That way you’d have a feel for what a course is like, and you’d know exactly what kind you’d like to make. At that point, you know better what kind of information to look for when creating your course. You definitely nailed it Jen…I have been rethinking this for a while now and refocusing. I am excited about 2015 and re-energized. Thank you! Thanks for sharing this! It gave me hope for the future of my little blog! SO timely and SO inspiring. I refuse to waste a year working hard on someone else’s dream! AND I refuse to chase someone else’s dream and measure my dream against theirs! Already passed it on to several friends! Thanks, Jarrett – glad it was helpful. I appreciate you! Thank you for this beautiful reminder! I definitely needed it as I’m preparing to create my 2015 business & blogging goals. Hi Felecia, I think you really need to be listening to your readers for cues on what you should make for them. What are they saying in the comments on your blog? What types of questions do you get via your contact form? There’s no one-size-fits-all approach to creating products; you have to listen closely to what your readers want – how you can help them get closer to their goals. Thanks for this, really needed to read this as I sit down to contemplate my blog’s future for 2015. The question is what do I write ebooks about? Isn’t it a bit of a chicken/ egg scenario i.e. Who’s going to want to read my work if I’m not already successful? Hi Cheryn, you should really check out my reply to Jess above. You don’t have to already be successful to create products. Just the act of researching for and creating a product is a huge credibility booster. People will see you as an authority and it can actually help your blog grow faster! That’s really encouraging Jeni, thanks! I always thought I’d need to establish myself as a ‘successful’ blogger and then be ‘worthy’ enough to produce products that people will be interested in! My only question to the idea of selling a product versus giving away something for free (the blog), is how much content should you have so that once you give it away someone has a reason to find YOU and come back for YOU. I don’t think there’s just one answer to that. A better question might be, how much are you helping your readers do or be something they want to do? How much are you helping them achieve their goals? They keep coming back when you show that you can make their lives better, whether that’s in a “free” way or it’s a product they’ve bought. Does that make sense? It does make sense! Thank you for your opinion! By the way, congrats on your new arrival. She’s beautiful! Oh, did I ever need to hear this. I published an e-cookbook a little over a year ago with two fellow bloggers, but my dream has been to publish my own. I want to do a devotional and a book on marriage for young wives. The trouble is, I don’t know the first thing about properly formatting an e-book or getting it on Amazon eventually or (yikes) designing a cover. And since I’m not really making money from my blog (except occasional sales of the cookbook), I don’t really have any money to hire anyone to do the stuff I don’t know how to do. Honestly, my advice would be to commit to making your book as awesome as possible so you can charge $20 or more for the value you’re providing. Then sell it via your blog and make 100% profit…rather than trying to price it really low and only making a little bit per copy…and then losing even more profits on Amazon. All your truly engaged readers will buy your ebook – and that will at least get you a few hundred dollars so you can reinvest it in hiring someone to do a more professional book cover for you. That’s the short version, but you might think about doing things in stages just so you can fund your project and make it the best it can be. I’d also like to chime in with Canva.com as a suggestion for a free online photo/text graphic app. Nothing to download and it has really helped me build Pinterest-worthy graphics for my blog. If you have or can take a cover-worthy photo (well staged, tweak the colors/etc in a photo-editing app) you can upload it to Canva + slap some text on it = instant cover! Then you can download the image as a quality PDF. Also, if you type all your eBook in Word, you have the option to “print to pdf” so your entire book is ready to go as a pdf! Just import your cover image to page one so it is part of your pdf. Good luck! This got my gears turning now…. Thanks for chiming in with your helpful advice, Annie! Wanted to jump in and say that recently I heard someone state that making an ebook is as simple as typing in Word. You don’t need any fancy ebook software. And, fiverr is a great place to look for cheap ebook cover designs. And I agree with Jeni that a good goal is to sell your product directly first. Amazon takes a huge bite out of your profits. Wonderful! Thank you so much for the tips and ideas! Great points. Thank you. Here’s to a wonderful new year! Thanks, Margaret Anne – glad you found it helpful. 🙂 I’ll be sending out something in the next few days that I think you’ll enjoy. I’m excited to see where you go in the new year! Wow! I needed this. Just this morning, I’m thinking about the new year and thinking that I had such high hopes for my blogging to be more by now, more readers, more money. And I’m better than last year. But I’m still not where I want to be. So I was reflecting about whether or not it’s worth it and how much it’s worth it. And then I read this. I’m so glad you’re here, Leah. I wrote this post for bloggers exactly like you. You have so much wisdom and experience to offer the homeschool community – be bold and teach! In many ways I SPOT ON agree with you. When I first started blogging I read the problogger book and he really spoke to me when he said don’t put all your eggs in one basket. That principle has been a guiding factor for me in starting up my entrepreneurial business. Which is why I have a printable selling product planned for 2015! It’s also why I don’t allow myself to freak out when Facebook, Pinterest, Google, and WhosItWhatsIt changes their algorithms yet again…I can’t give any one company control over my business and my traffic. However selling products does put you at their whim a bit because you have to get people to your product somehow and unless you rock SEO and are super niche specific, it’s a noisy world out there! So, by creating multiple posts about different things I can diversify and hit more people to get them to my site and make money off of them thru advertising and sponsorships that wouldn’t have normally come to my site for whatever I’m selling. Of course if what I’m selling fits the post their visiting, you can guarantee I’ll be marketing that product to them while they’re reading my awesome post. Love your thoughts here, Kimberly. It also speaks to the fact that you don’t have to stop at just one product. A friend of mine who is a very relaxed blogger has written one ebook per year for the last three years, based on the different things people come to her blog for, and it has created a really tidy income for her family. Sound like you’re doing things the smart way! Absolutely agree that continually creating is a great bit of advice. Ideally I’d like to have something for each “channel niche” I cover on my blog. I fall into the same issue as the commenter above stated, what do you give away and what do you sell? 🙂 However, you’ve given me a bit of a spark of an idea for something late next year that will be a different target market than the printable I’ve already planned to launch in the spring. It is an exciting thought to think of seeing my endeavors placing money into my pocket while I sleep in more products that just one. Ah Jeni, awesome post! I can tell you I am so tired of ad networks. It’s just not worth it, they take up prime real estate on my website and they make next to nothing. When I first started blogging I thought ads were the way to go- now I’m realizing this is not the case. Time for a full website redesign, creation of my own products with real value that I may actually see revenue from *gasp* a girl can dream. Just keep chuffing along and maybe someday it’ll all make sense. WOOT! Fantastic, Chantelle – I can tell you’re headed for greatness. It’s just a matter of taking back that prime real estate and putting it to use for something your readers want. I’m excited to see where you’ll go with it. Yes, Jennifer! Focus on serving the audience you already have. I know several small bloggers who are making a big splash with their own readers. It’s just a matter of figuring out what will help them solve their problems or achieve their goals, and delivering that. Yes! Just 2 months I started selling patterns on etsy and I love the straight-forward business way of making money there. But–question, is that the best place to sell stuff, or do you have a better suggestion? Etsy is really powerful just because they have such a huge number of people already shopping their marketplace. But you can have the best of both worlds, keeping your readers on your blog, with a plugin called Etsy 360. I installed it last week for a client, and it’s super simple to use. The one problem with Etsy, if you have virtual goods (like patterns, tutorials, or any other PDFs for sale) is that they take such a big commission. There’s another plugin called Easy Digital Downloads that allows you to sell downloadable items straight from your site, and it’s free. You might check those two options out. So helpful!!! One more question, if you don’t mind. Thinking about installing the easy download plugin and NOT the etsy plugin. Therefore people that find me on etsy can buy there, but people on my blog will only have the option to buy there. Wise? I hadn’t looked to see exactly what you were selling – if they’re all printables or virtual items, then yes! Definitely have them for sale just on your site with EDD. That way you don’t have to pay Etsy’s fees. Thank you for the encouragement. I’ve be blogging for seven years as a hobby, in May I decided I wanted more out of it so I made the switch to WordPress and started following you and several others who seem to know what they are doing. Sadly, most of the others are only focused on the large pageviews and large amounts of time they spend working on their business. Well, I’m not willing sacrifice my family for this, so I really think an e-book will come into play this next year. Funny, I’ve been kicking around the idea of this but you’ve given me that little push to get it completed. Thank you!!! That’s awesome, Lori. Not everyone has the time (or wants to spend it!) chasing page views. While there are ways to get more page views without a ton of extra work, it’s also good to focus on making money in ways that don’t require them. And the bonus is, you get to serve your own readers by delivering something they need and want. I’m excited to see where you go with this – keep me posted! I needed to hear that! I’ve been in the process of putting together my e-book, but sometimes it’s so easy to get caught up in page views. Hoping 2015 brings success to others reading this as well as myself! Happy Holidays! This is the best new year blog post I’ve read (from any year!). You are spot-on with your advice on finding out what your readers want and giving it to them. Sooo This is a perfect time for me to really think…what will I do different in 2015 that will make MY dreams come true. Thinking, thinking, thinking….. Yes it definitely is…I know nothing! LOL But I’ll learn 😀 Thanks Jeni! Oh, I’m so glad you’re still here after my extended break! Honestly, fear is what holds most of us back from achieving greatness – I personally have a really tough time with it, mostly because I’m a perfectionist and I fear that other people look at my work as critically as I do. But this is the year to push past that and serve our people powerfully. Do you know, I don’t think that publishing an ebook would get in the way of publishing in a traditional way. If anything, it boosts your ability to show you have something people will buy! For example, Brooke McGlothlin has an ebook she’s been selling for four years now – and she’s releasing her book (perhaps the same one?) with a traditional publisher very soon! I know you already listen closely to what your readers need. It’s time to give them a solution they can buy, so they take ownership themselves. I’ll be cheering you on. I just started blogging this year and was feeling just a tad bit disappointed at this year end. This message was so important for me to hear as I plan for 2015. I can think of the year as a failure, or I can think of it as a learning time-learning social media, web design, monetization strategies, and most importantly finding my voice. I choose to be positive and know that as I continue to work hard for MY dreams, 2015 will be a great year! Thank you for the inspiration and all the tools for success. Thanks for stepping out and leaving a comment, Karen. It sounds like you’re committed to the hard work it’s going to take this year. But make sure you’re putting it in the right direction and working for yourself first. I’m so glad you’ve decided to be part of The Blog Maven. Wishing you lots of success this year! So inspiring! If blogging (and the product we sell) comes from the heart, how does that mesh with figuring out what our audience wants? Do we create a product for our audience, or find and audience for the product we are passionate about producing? Hi Farrah, that’s a good question. Always start with what’s already working. If you have followers, it’s time to just step out and ask them – What’s their biggest frustration in motherhood or in their lives? Once you start listening closely, you’ll notice patterns – more than one person will say the same thing. That’s where you start. And if you already have a product you’re passionate about producing, then just start writing about it to your own audience and see how it resonates. The biggest thing is, your product needs to solve a problem, meet a need, or help someone achieve her goals. That way you know it will sell. This really hits the ‘bulls-eye’ for me. Thanks for reminding me that I need to think more like an entrepreneur and stop chasing page views. I freaking LOVE this post. So many words of wisdom. Being 6 months in with my blog/business I can relate to so much of what you said in this post. Thanks for sharing your awesomeness and reminding me to keep on sharing mine! I have been mulling over ideas for an ebook, but now I’m really intrigued by the idea of an ecourse. Do you know of any great examples in the blogging world that I could look at? I wouldn’t even know where to start, but you’ve definitely given me some great motivation to DO! Hi Charlee, the best thing you can do to figure out how you’d like to create your ecourse is by starting to take them yourself. Different people have different styles of teaching – there are email-based courses that are just a series of emails you pay for; there are video courses where the teacher is recording herself speaking; there are other courses that are screencasts. I really like Skillshare because they’re cheap and you get so many courses for your monthly membership. That would be a good place to start, just checking out what other people have done. Seems I am the only male here amidst these wonderful lady bloggers lol. This is a very good idea. In fact I had always been thinking to write one myself. But just time won’t be on my side. However with your spot on advice I am coming up with my ebook this year. Thanks a TON for the encouragement. I like that you’re encouraging us to create & contribute a part of ourselves rather than just making money on advertising. It feels good to be part of the greater good 😉 Thank you so much for writing from the heart and sharing valuable information! This is literally my business motto, and I say it to people alllll the time. You either work hard building your own dream, or work hard building someone else’s. I don’t care how much I make or what happens to me – a regular paycheck from someone who is making their dreams come alive is nothing even in my worst month. I also like this one,” If you build it, they will come.” Said in a whisper of course. Build those dreams and launch them BEFORE they are perfect too! Thanks Jeni. Makes me feel motivated reading your posts. Thanks for this encouragement! I have a blog focused on homeschooling, food, and homesteading – all centered around life with kids. I’ve created several products already – an ebook on nature walks, a cooking/baking/herbal course for kids, and a free e-course on organizing the mountains of toys, and a free Advent program. I feel like I’m at a speed bump – a lot of my sales are from local people – friends and family and some strangers who love my products – and there aren’t a lot of other sales even though I see people from all over the world are reading my blog and I get quite a few downloads from all over of my free resources. What can I do differently to get the word out or more effectively utilize these resources I’ve created? Thank you! – Are you promoting your items regularly to your email list? Do you have an automated system for handling this when people subscribe? – Do you link to your products from related posts? – Do you have any ads visible on your site to pique curiosity when people are casually browsing your posts? – Are you appealing to readers about their need for your solutions on an emotional level? Most people make snap decisions based on emotions, then rationalize their decision afterward. It sounds like you need to look an overall marketing strategy for your products, since you’ve already done so much work creating them! I will work on these things. I do often link to other posts and products within my posts. However, I do not have many ads (just one on the top of each page for sign up to my free toy organization course) and I am very light on marketing through my newsletter. Better get on it! This has defiantly been one of my favorite blog postings I have ever read. This is so inspirational! For me, it does not apply just to blogging, but to your entire life. Work for something YOU want and make it happen. I really loved this. Thank You!! Glad it got you moving, Kasey. I want to know when your project gets underway – keep me in the loop! Thanks Jeni. Such a great reminder. I had read somewhere else recently about the benefits of creating an ebook and now with your encouragement I know what my first project for my blog for this year will be. Thank you for the inspiration. 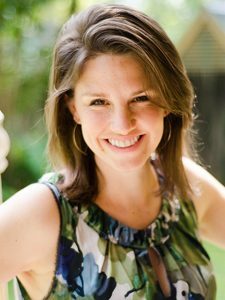 I’m not quite a year in and I’m struggling to feel unique in an ocean of mommy bloggers, all of us writing about wonderful, important things, but all of us essentially writing about the same thing. That’s such a true statement, Natasha. Part of standing out from the crowd is listening deeply to the frustrations and goals of your own readers, and helping them meet those goals/solve those frustrations. You don’t have to be so different – you just have to meet your readers where they are. I’ve started an E book several weeks ago, and this awesome post has given me the resolve to get it finished! Thanks Jeni! Woot! Awesome, Tamara – I want to hear how it goes, so please keep me posted! Definitely share your goal-related posts when you’ve written them. I’m a productivity junkie. Wow Jeni! THIS is the post that I am printing out and pasting everywhere in my office!! I have been blogging for two years. I have a very dedicated audience, have made great strides writing for publications and and having my crafts/ DIY projects featured on very prominent websites, but I haven’t made a dime! I don’t want to go the advertising route and frankly I don’t have 100,000 views a month, so I was hanging back. Your article has made me realize that I have a lot to offer. I am actually interviewing today for a social media marketing specialist position and, thanks to you, I am going to write an ebook!! My question is, can I include a post or two that I have already written about on my blog in my ebook (if I do one on crafting simple wreaths, for example) or should it be all new content? Thanks for the push and Happy New Year! You know what, Kim, you can use nearly all existing content – up to 80%. Most people who read your blog won’t have seen even half of those projects yet, and people pay for convenience. Just having all the resources in one PDF is valuable. I’m excited for these new opportunities you’re pursuing – you have SO much to offer, and your audience deserves the opportunity to buy a product that will help them get closer to their own goals. Cheering you on! Thank you so much, Jeni! You are super sweet and have just made my night. Seriously, 80%? Who knew! I am getting started on putting that book together right away! You sound like my husband who says that instead off fixing broken links and starter tag/category problems and revamping the blog to over 40 women instead of just women living in cold climates I should finish my fashion book. I think another problem of my blog is that I have 30% male readers. Why would a guy read a fashion blog writen by a 52 year old women bundled up (stylishly) in layers of clothes? And most of the comments I get from guys! It’s perfectly normal to have a variety of people reading your blog – yes, even men reading a fashion blog. On my own blog, I have 38% men reading (or so the stats tell me), but I might only have one male comment on a given post. I think that a lot of times, men feel strange reading women’s blogs – but if you’re a genuine, friendly, likeable person, there’s no reason why they wouldn’t want to. As for the fashion book, I’d make sure you have a market for it before deciding to go that route – if you don’t already have enough evidence. Have you asked your readers yet what their biggest challenges are with looking stylish in cold climates? If you aren’t filling a specific need with your book, you might have a hard time selling it; that’s the #1 reason ebooks don’t do well – the author jumps in and starts writing before doing a little research to see what questions her audience actually has. I love what you write! I printed the review picture of your 9 ways to bring readers to your blog and printed it and have it in my inbox to remind me. Now I’ve just got to get busy and DO IT! I started a blog a year ago and I voraciously devour all blogging information, advice etc. I know what everyone has to say on most topics. I however always learn new stuff from you Jeni…stuff that commands my attention, stuff that is definitely out of the blog. I love it. My blog is for Kenyans who live abroad so not all the advice can work for my situation. Therefore I always have to be very innovative. Kudos Jeni! Thanks, Anita – glad you’re getting lots of good info here. …and I received your email over the weekend; will be replying early this week. So glad you’re a part of the Blog Maven! Thanks for replying Jeni. You got my email…will probably frame your reply……you don’t know how frustrating it is not to get anything out of a how-to-blog article or it not being something that’s been regurgitated over and over on the net. I appreciate you immensely. I really love this! As time goes on, I focus way less on my numbers and more on how many comments I’m getting or how much people are thanking me for this amazing information. This year I’m even starting to branch out into freelancing. I’m looking at the numbers for fun and seeing how people get there and how long they stay and stuff like that. But my main focus is to just help people! Once my mindset started changing, I noticed I enjoyed it more and stressed way less and started producing amazing results. How you look at it really does make a difference! I love hearing about your experience, Amber. I totally agree – everything chances when you start moving your energy to helping others. It’s like blogging karma. 🙂 Thanks for sharing! Incredibly inspiring thank you so much for your information. I have been mulling over writing an ebook for my recipes that I have on my blog. So this has been a great push for 2015 in order to do so. So glad you’re moving forward with your ebook, Rosie! Just so you know, you can use mostly content that’s already on your blog (up to 80%!) – and that may help you publish even sooner! I hope you’ll share the good news when you launch your book. I’ll be cheering you on. In my experience, Kristy, the more you focus on helping the readers who have already subscribed to your blog, the happier they are to do the promoting FOR you. 🙂 Wishing you lots of success this year! I have been thinking about this a lot and have been coming up with idea on how to build my dream instead of someone else’s. Since it’s a brand new year this is the perfect time to put things into action. Thanks for the inspiration! Loved the post, time to pull up my socks and DO IT. congratulations on your new addition! Glad to see you are posting again. Love what you wrote re 2015. It gives me some encouragement to keep at it! My site is launched, things are moving forward and I can tell that my posts boost my site. So here’s to a positive year for http://shoppersworld.com and my posts, and to you and your continued success! Thanks. This is precisely what I needed to read today. Thank you so much! Hi Jeni! Thank you for this really great inspiring post! I’ve been reading from other blogging experts that entrepreneurship is the way to go as opposed to ads and I get that. I really do. My problem is that I write a book review blog. I’ve been working at adding a bit more lifestyle posts lately but for the most part, my blog is books. I want to write an ebook. I’ve even opened up a document for an ebook and that’s as far as I’ve gotten. I’ve thought perhaps a how-to start a book review blog but that seems so limited? Any suggestions? And thank you for opening up this topic for discussion! So incredibly helpful! I’ve been giving this some thought since you posted it, and…my conclusion is that it’s going to be really hard to put on an entrepreneur hat if you’re dedicated to solely blogging about book reviews. Most book review bloggers that I know do so just to get the free books themselves, but I haven’t spoken to too many of them that make good money blogging. Here’s my thought: what if you shifted your focus a bit and started interviewing some of the authors? You’d be amazed at how most authors will jump at the chance for an interview, since most of the book’s promotion falls on their shoulders, and most of them have no clue how to work social media, or how to draw in a crowd with their own blog. The idea is this: you interview authors – about the books, sure, but also about the creative process and the business side of getting published (I’m sure you can think of other things)…and you publish the interviews on your blog. That would start building your expertise and authority in that space. (…plus, can I add? The content practically creates itself) And it probably wouldn’t take you too long after starting these interviews to get some really great insights into the book world that you could turn around and teach. John Lee Dumas is a great example of someone who has done this. He has a podcast where he interviews entrepreneurs – although he had no clue about it before starting the podcast a year and a half ago – and he’s now one of the most successful people online. I’m sure this isn’t what you had in mind, but it’s at least some food for thought. If it was my blog and I couldn’t figure out how to monetize it, I might shift my model a little until I could. Does that make sense? That was such incredibly useful information Miss Jeni! I have just started work as an article writer for a software company and I have trying to learn as much about this whole process as possible. This is my favorite bit of insight yet. Just the sort of post I needed to see, Jen! I lost my job (FIRED!) just 2 days ago and now I’m going to try to focus on my blog 100% to turn it into a full-time income instead of the part-time income it’s been. This is just the reminder I needed to work on an ebook for my readers! Question: What do you think of ebooks that are a compilation of, say, a year’s worth of projects, all packaged up nice and need in a pretty ebook? Do you think books such as that are worth writing, along with adding in some new content and tips/articles? Put those projects together, tie them up with some good writing that makes them a cohesive unit, and launch! And please let me know when you do – I’ll be cheering for you. Thank you, wonderful and smart advice. This has inspired me to re-think my blogging goals for 2015. I have no idea how I stumbled across this blog, but I’m definitely glad I did. Thank you. Gosh I really want to start an ebook but I’m so nervous it won’t sell..and I have no idea how to even go about this! Do you have any tutorials or sites you recommend? I’ve been recommending the From Idea to Ebook course from Mandi Ehman – she definitely covers all the bases, in a very practical way. That’s probably the best one I’ve seen yet. Would love to hear when you get your ebook out the door – keep me posted! Thank you so much, Jeni! I will definitely let you know how it goes! Might I add–the discussion on this post alone is enough info for an entire post! Some good nuggets here!! Somehow I stumbled across your website today and I am so glad I did. Thank you so much for this article! This is exactly what I needed to read right now. I’ve been blogging for a little over a year and I’ve kind of hit a wall. I’m slowly getting more readers so I always thought the next step was to start working with sponsors and other partnerships that would help monetize my blog. Now I realize although those things aren’t bad, I rather spend the time researching how to create my own products specifically for the enjoyment of my readers. You truly opened my eyes and helped me refocus. Thank you for your insight! Rae, you know I wrote this just for you, don’t you? Sad it took you a few weeks to find it, but I’m glad you did. 🙂 And I’m thrilled you’re focusing on moving ahead as an entrepreneur. You won’t regret it. Love this!!! Thank you for the practical advice, as well as the empowerment. I am looking forward to refocusing and applying these principles to my process. I am glad I found your blog, I learned helpful tips on how to improve and possibly earn from blogging. For sure I will visit here from time to time to learn more and apply them to my own site. Jeni, you spoke directly to me. I literally found myself nodding “yes” to everything you said. I just wanted to say “thank you” for the encouragement. I wanna print this post to place next to my desk when I get discouraged. Hugs to you!! Thank you!! Glad you found it helpful, Ashlyn. Hope you have positive energy to move forward in a new way! It never crossed my mind to write an ebook until now, what a good idea. I however do not know how to do that but I am willing to learn and figure it out… My blog is slowly growing but I am getting discourage because it feels like I have done everything I could but I am stuck with 700 views per day after 1 year of food blogging. Is this normal? I hear you – it can definitely be frustrating to pour tons of time into your blog and not see the results you’re looking for. The question I’d ask you is, of those 700 views per day, how many of them are converting to subscribers? There aren’t any statistics on what’s “good” for number of page views on a blog, because it depends on what you’re doing with those pageviews/readers. I will tell you this: if you have a very focused blog that’s serving a specific group of people, then your site has the potential to convert about 3% of visitors to subscribers. So, if you have 400 new visitors each day, you should get about 10-20 new subscribers per day…but you have to be very intentional about how you communicate the value they would get from subscribing to your blog. 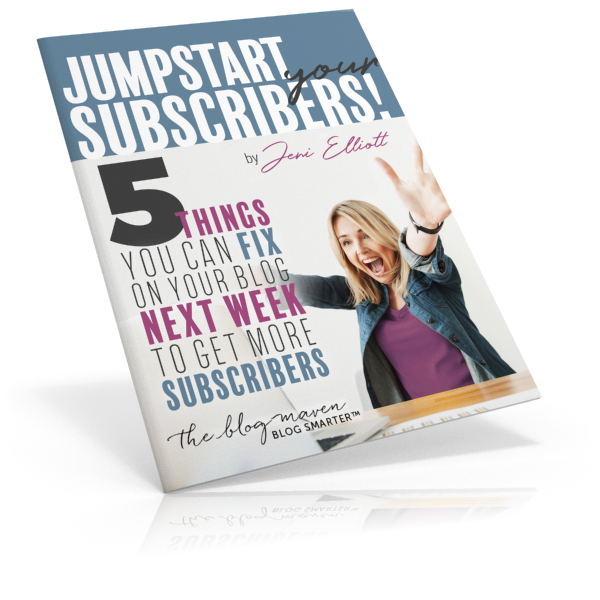 If you’ve already downloaded the “Get More Subscribers” guide, I hope you’ll take a serious look at each step! Another great post with good insight on what we as bloggers need to do in order to please the readers. I will take your knowledge and utilize it in my future posts. Really loved this! It’s a nice reminder to take a step back and evaluate if you’re really adding value for your readers. Another helpful tip, to find out what your readers really want is use the email analytics feature in your email marketing service dashboard. A lot of times what happens is, readers open your newsletter, but they don’t really click on the links. If you study this, you’ll find out what your readers really want from you. I have been using this technique for a month now, and I have seen a spike in subscriber’s count. Create content for you existing readers and if they’d like it, then they will share it with their friends, which will surely turn into subscribers if they’d like your content. Wow. This kind of post I want every blogger, including myself, to read about as a source of inspiration. Blogging should be something that is more than a passion at first, until it will always be something like that. It’s all about doing what you love, the earnings as a result are a bonus. What a wonderful post! You are a phenomenal writer and your content is superb. I’m in the process of (finally) launching my blog and have to say that of all the research I’ve done, your blog has become my go-to resource. Thank you for what you do! Can you lead to me to your content or resources that show how I can install a subscribe form that allows readers to download a free PDF or eBook? Similar to what you’ve done here at theblogmaven.com..
Hi Maya, sorry I’m just now seeing this! Any subscribe plugin will do – the trick is simply to deliver the free PDF in the “Welcome” or Confirmation email. All my widget areas are custom designed, but use LeadPages to collect the information. Hope that helps point you in the right direction! Thanks so much for this, Jeni! As a content marketer, it can be so easy to fall into the trap of statistics and analytics, all the while forgetting why we are creating the content in the first place! And I completely agree that you don’t need to be getting a huge amount of traffic before you start making money from your blog, or before you start treating your blog professionally. It’s all easier said than done yet you’ve clearly done it! Thanks for this inspirational post! Looking forward to learning more from you! Hmmm. I put my eBook to the side a while back, but this post made me pick it back up again. I’m going to finish it! Thanks for the motivation! I was just feeling discouraged about my pageviews – wanting to reach a certain number for an ad company. I need to shift my mindset to one of entrepreneur. I DO have an ebook I launched in November last year, but I need to do some serious marketing. I’d love for any feedback you might have on the sales page – I’ve linked to it for my website. Thanks! Thanks a lot, @Jeni, for sharing these actionable TIPS! I’m much eager to implement your strategies! Being an entrepreneur is not a piece of cake. We have to work hard days in and days out. I have just started my technology blog, could you please let me know how can I re-invest my earnings in my blog ? Should I go for a better content planning or just spend on promotions ? Hey Jeni! For the second-half of 2018, I am excited to pave the way for my signature course. I’ll be opening it up to 25 beta testers soon and then will use that feedback to make something GREAT. Maybe a lite or second beta launch in the fall and then the full-course in January 2019! I am planning to reopen my online gift shop and align the products on sale with my brand. Thanks for all your sound advice and encouraging posts. I’m working on a content audit to streamline my site and make sure everything there is on-brand as well as working on making deeper connections with more readers.